You'll be £8.00 closer to your next £10.00 credit when you purchase The Women’s Army Auxiliary Corps in France, 1917 – 1921. What's this? In March 1917, the first women to be enrolled into the British Army joined the newly formed Women’s Army Auxiliary Corps (WAAC). The women substituted men in roles that the Army considered suitable, thereby freeing men to move up the line. The WAACs served, for example, as cooks, drivers, signallers, clerks, as well as gardeners in the military cemeteries. Due to their exemplary service, Queen Mary gave her name to the Corps in April 1918 and it became Queen Mary’s Army Auxiliary Corps (QMAAC). By the time the Corps was disbanded in 1921, approximately 57,000 women had served both at home and in France. 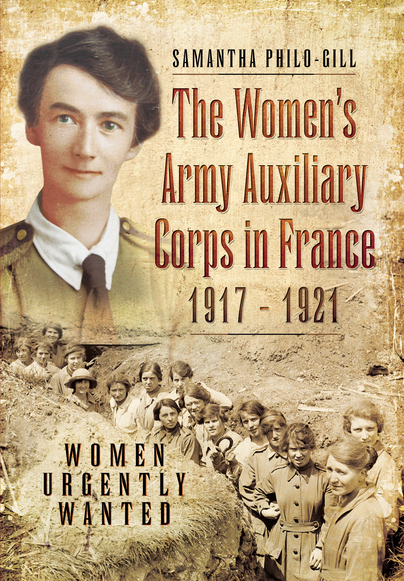 This book details the establishment of the Corps and subsequently explores the experience of the WAACs who served in France. It follows the women from enrolment to the camps and workplaces overseas, through to their experiences of the Spring Offensive of 1918, the Armistice and demobilisation. The final chapter reviews how the women have been remembered in art, literature, museums and memorials. Throughout the book, the author locates the women in a society at war and examines how they were viewed by the Army, the general public and the press. The author draws on a wide range of sources to provide the background and uses the oral and written testimonies of the women themselves to tell their stories. This book will be of interest to social, women’s and military historians, as well as family history researchers. This is an interesting and well structured book on one of the more socially significant elements of the British Army of the First World War. Throughout the book's 204 pages, Philo-Gill's ability to tell a story shines through. A small selection of black and white photographs and illustrations are included and are genuinely helpful in illustrating points from the main text. Comprehensive notes and an index complete the package. The story of the corps through inception, deployment, service and demobilisation is an engaging and enjoyable read, often citing primary sources. However, as well as a story, this is a serious bit of history and research, with thorough examinations of almost any aspect of the service you could imagine. Towards the end of the book, once the main thrust of the wartime service is complete, the final chapter becomes more of a catalogue of research covering memorials, literary references and art. These sections will be of less interest to the general reader, but they contribute to the completeness of the history. For historians looking at the history of the WAAC, this is a comprehensive account, however, there is much here for the general reader who wants to understand more about the contribution of these adventurous and brave women during the Great War. This book is a fitting memorial to all the women who served in the WAAC/QMAAC. Skilfully blending official documents, newspaper reports, private letters and memoirs, this excellent history covers all aspects of the WAAC from pay, to work, social life and living conditions, in the women's own words where possible. Well written account of an often overlooked branch of the armed services during the war. The author has provided a unique glimpse into the world of women at war. The Great War needed women to be mobilised in large numbers to make up for the loss of men, creating a revolution in society. I loved this history about a part of World War I that has very little information on it. The women who went to the front lines of the war, so men in certain jobs could be put on the line if they were fit. They had many issues to overcome in doing their job, not just from the men who were happy to serve their country but be out of the line of fire. It's a great history to read, especially for the centennial of the WAAC's being founded. A great deal of research obviously went into the writing of this history of the W.A.A.C's of England in WWI. And it is an awe-inspiring tale - these young women willingly placed themselves in a position never before tackled by women, and faced not just the very real perils of war in the front lines but the censure of a society that expected it's 'girls' to stay at home and follow the rules, rules set in stone these many generations. I found myself appalled at the rumors and rustling whispered attempts to discredit these ladies, and indignant for the lack of understanding from the home front of the sacrifices they were willing to make to help win the war. Proud of the families who stood behind their girls, and very pleased at the adventures they managed to work into their very frantic 48 to 60 or more hour week's work schedules. And I was inspired by their loyalty to country, and truly grieved by their casualties. This is a primer for all women everywhere - what it takes to actually be bravely committed to our country and our history. To be able to smile in the face of adversity and find good in the day, no matter how hard it is. And how difficult it is for family to let go of expectations in a time of trial. Many of the freedoms and privileges we woman take for granted today came about through the bravery of these mostly very young women. This is a useful textbook for research purposes. This really should be a book which is appreciated by social historians with an interest in this period. Indeed I would suggest that this should be of interest to many who simply have an interest in the broader subject matter, war or social history generally. While this is the story of the WAAC in France and covers just four years it is an important story in a wider context. It seems likely that many sociologists as well as historians would consider the changed role of women in the First World War was an integral part of the changes in society in the 20th century generally. In this sense this important book combines a diligent academic approach with ease of reading - not all that common. Samantha Philo-Gill holds a degree in Geography from Durham University and an MA and PhD in Creative Writing from Brunel University London. She has had a lifelong interest in military history, specifically the role of women. As part of her PhD, she examined the representation of women war workers in WW1 literature. She lives with her husband in London.